You may not think of pet birds as cuddly, but the friendly cockatiel will change your mind. This bird is one of the most popular species of pet bird and for good reason – they are outgoing, comical, and affectionate with their owners. Like all pets, however, they have specific dietary needs that must be met if you want your cockatiel to be healthy. Keep reading to learn more about what makes cockatiels such great pets and to learn about their nutritional needs. You’ll also see our top 5 picks for the best cockatiel food. What Do You Need to Know About Cockatiels? How Much Should You Feed Your Cockatiels? How Many Times a Day Should You Feed Your Cockatiels? Also known as the miniature cockatoo, the cockatiel is a species endemic to Australia. These birds are popular household pets throughout the world, second in popularity only to the budgerigar or budgie. The cockatiel was once thought to be a crested parrot or simply a small cockatoo, but recent genetic evidence revealed it to be a member of its own subfamily. The cockatiel is the smallest bird in the cockatoo family but still a medium-to-large size compared to other pet birds. The average cockatiel stands 12 to 13 inches tall, with its long tail feathers making up roughly half of its length. These birds are also known for the distinctive crest their wear on the top of their heads which they use as a means of expressing emotion. As a pet, the cockatiel is a joy to keep. These birds are very outgoing and often have goofy personalities, but they are also known to cuddle and be very affectionate with their owners. In terms of their care, cockatiels have higher needs for space than some pet birds, and they require a balanced diet. In the wild, cockatiels are natural foragers, so they are constantly looking for and picking up food from the ground. In captivity, they enjoy having food or treats sprinkled on the bottom of the cage for them to discover. In terms of their dietary needs, most cockatiels do well with a commercially balanced diet supplemented with seed and fresh vegetables. Commercial pellets – Most commercial pellets are nutritionally balanced for the intended species, so they should be included in your cockatiel’s diet in some way. Seeds – These are a staple of many bird diets, but you need to be sure to include a variety of different seeds, so your cockatiel gets the nutrients it needs. Fruits and veggies – Commercial pellets generally don’t contain the phytonutrients cockatiels need for a balanced diet, so include some fresh fruits and veggies in your bird’s diet. Low grit – It was once thought that cockatiels needed grit to boost their digestion, it is now known that cockatiels shred their seed before eating it and don’t need grit as a result. Keep reading to see our top 5 recommendations for the best bird food for cockatiels. There is a great deal of controversy surrounding the use of pelleted diets for cockatiels, but many believe it to be the most nutritionally balanced option. Whichever diet you choose, make sure you feed your cockatiel a high-quality product. Cockatiels love to forage, so a bird food that appeals to that desire is a great choice. 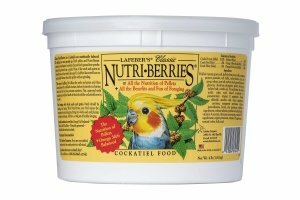 This Lafeber’s Cockatiel Nutri-Berries Cockatiel Food is nutritionally balanced but is formulated to appeal to your cockatiel’s foraging needs. It features human-grade, non-GMO ingredients with no artificial colors or preservatives in a nutrient-rich, flavorful recipe. 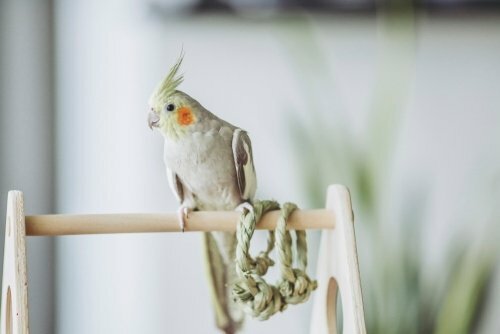 Your cockatiel will receive all the nutrients it needs for healthy and balanced nutrition while being encouraged to exercise and play. 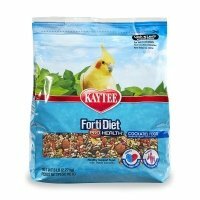 If you prefer to feed your cockatiel a varied diet of seeds, fruit, and vegetables, then this Kaytee FortiDiet Pro Health Bird Food for Cockatiels is a great option. It is uniquely formulated for cockatiels, both in terms of balanced nutrition and by including the ingredients cockatiels love. This formula includes a rich blend of seeds, grains, and pellets to give your bird nutritional variety with beneficial supplements to ensure optimal nutrition. Plus, it helps enhance skin and feather health while supporting general health and immunity. 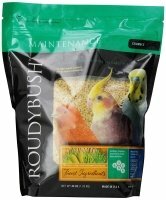 To ensure that your cockatiel gets the nutrients it needs on a daily basis, consider this RoudyBush Daily Maintenance Bird Food Crumble. This formula is designed for daily maintenance, and each pellet is complete and balanced for small to medium birds like your cockatiel. It is 100% edible with no animal by-products and it is free from added colors, sugars, and artificial preservatives. This formula is made from the finest blend of ingredients and nutritionally balanced to keep your cockatiel healthy. 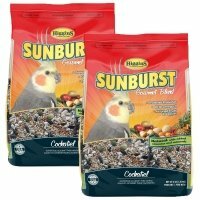 For cockatiels that love to forage, this Higgins Sunburst Gourmet Blend Cockatiel Food is a great option. It features a varied blend of seeds, fruit, vegetables, and extruded pellets to ensure complete and balanced nutrition. Overall, it provides 15% protein and 11% fat, an ideal blend for your cockatiel. It is completely free from artificial colors and flavors but contains beneficial supplements to ensure that your cockatiel’s daily nutritional needs are met. 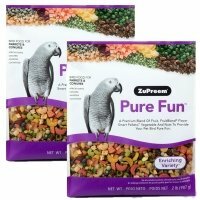 Cockatiels are an active breed and this ZuPreem Pure Fun Enriching Variety Medium Bird Food provides for the bird’s nutritional needs while also encouraging play. This bird food contains a precise blend of seeds, fruits, vegetables, and smart pellets to provide balanced nutrition that also enriches your bird’s experience. It is fortified with essential vitamins and minerals to ensure complete and balanced nutrition but is still fun and exciting for your bird to eat. It is uniquely formulated for medium birds like cockatiels. If you’re feeding your cockatiel a diet that consists primarily of pellets, you’ll only need about a quarter cup a day. For birds that eat a varied, seed-based diet, you’ll be feeding your cockatiel about 1 ½ to 2 tablespoons of seed per day. Make sure to include small amounts of fruit and vegetables as well. You might also include some protein from cooked chicken, hardboiled egg, or cottage cheese. Most birds tend to eat small amounts of food throughout the day, so you may only need to feed your cockatiel once or twice. Again, cockatiels often enjoy foraging on the bottom of the cage, so spread some of the bird’s food around for it to find. Make sure you thoroughly clean the feeding dish every day before you refill it. When it comes to feeding your cockatiel, you can decide whether you want to go with a pellet-based diet or a seed-based diet. If you’re feeding seeds, you’ll need to include more variety in your bird’s diet to make sure it gets the nutrients it needs. Regardless, you should also be supplementing your cockatiel’s diet with fruits, vegetables, and protein. If you’re not sure where to start shopping for cockatiel food, try one of our top 5 picks reviewed above!